Following on from the blog A Big Development below…. It is interesting that the latest scientifically gleaned results to come out from the tests made on the remains of King Richard III, have raised in a question mark over the line of legitimacy on his paternal side. Someone, somewhere, somewhen committed adultery, and the resultant child was presented as legitimate. Hardly surprising. People will be people. In this instance, however, I am curious that the name of John Holland, 1st Earl of Huntington, 1st Duke of Exeter, has cropped up as a possible culprit. Holland was the younger of Richard II’s two half-brothers. They were the offspring of Joan of Kent’s first marriage, Richard II being by her second husband, the Black Prince. John Holland came to a sticky end at Pleshey, being captured after the unsuccessful Epiphany Rising of 1399, and was beheaded without trial in January 1400. His resting place has now vanished. 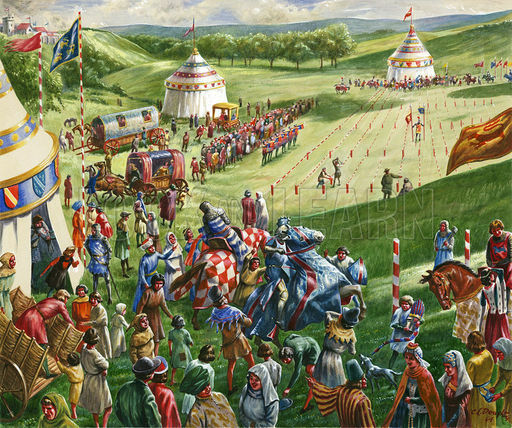 The rising had been against Henry IV, who had usurped the throne of Holland’s half-brother, Richard II. 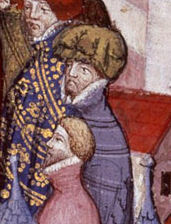 Henry IV was also Holland’s brother-in-law, Holland having married Henry’s younger sister, Elizabeth of Lancaster. As a young man, Holland had been quite a lad with the ladies. He had to marry Elizabeth because he got her into trouble when she was already married to a boy who was not old enough to consummate the marriage. John of Gaunt, Elizabeth’s father, had to hastily put things right. But such was Holland’s charm, that he and his father-in-law got on well. Holland was also known for his fiery temper, and had killed when in a rage, so he was certainly not a dull figure around the court. He was a fine warrior and jouster, one of the best, and appeared at international tournaments such as those depicted in the film “A Knight’s Tale”, which happens to feature the Black Prince, who was Holland’s step-father. How intricately it all links together . . . So, here we have a tall, handsome lord, depicted in the few illustrations of him as having red-gold hair and the short forked beard that was the fashion then. He is shown wearing the beautiful houppelandes that were so very much admired at Richard II’s court, and were worn by men and women alike. Holland was, quite literally, a knight in shining armour, dashing, passionate, charming, seductive, dangerous . . . and therefore irresistible to many women. Including, it seems, Isabella, Duchess of York. She had been Isabella of Castile (not the Isabella of Castile) and had accompanied her sister Constance to England when Constance became John of Gaunt’s second wife. Isabella was married to Gaunt’s younger brother, Edmund of Langley, 1st Duke of York. Edmund was not likely to set Isabella’s blood on fire, but when she met John Holland, the flames started. The affair, which pre-dated Holland’s marriage, caused a scandal at court. 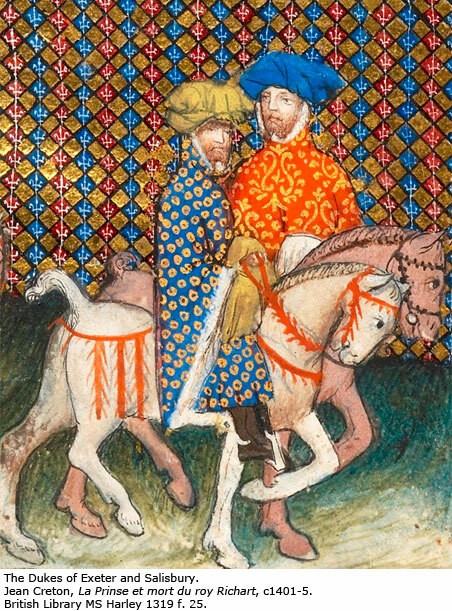 Chaucer wrote about it in “The Complaint of Mars”, which relates that the Candle of Jealousy (York) is approaching when Holland (Mars) and Isabella (Venus) are canoodling. The affair eventually ended, but there is a strong suggestion that her second son, Richard of Conisburgh, Earl of Cambridge, was Holland’s child, not the 1st Duke of York’s. IF this is true, then Richard of Conisburgh’s son, Richard, 3rd Duke of York (father of Edward IV and Richard III) was not descended from Edmund of Langley, and it makes John Holland Richard III’s great-grandfather. The thing that occurred to me, however, is that I have always wondered where the looks of Edward IV and Henry VIII originated. Both were tall, strong, handsome men of great charm (when they chose), and both are depicted as having red-gold hair, although whether that is artistic fashion-following is uncertain, for such hair colour was admired. So who do they sound like? Yes, John Holland. So, maybe the rumour about Richard of Conisburgh’s parentage is true after all. I am only speculating, of course, and those tall, handsome looks may well have come from elsewhere. 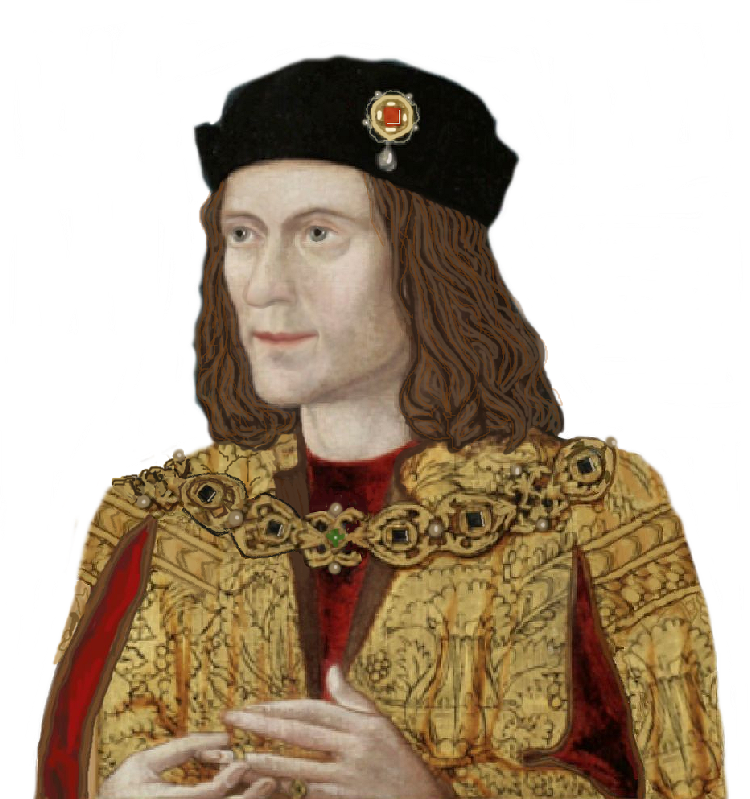 There is also the thought that Richard III was not like that in appearance, but was said to be more like his father, the 3rd Duke of York. Which makes me think that if Isabella had been small and darkish, then Richard III and his father probably inherited their looks from her. Yes, all guesswork, but interesting.